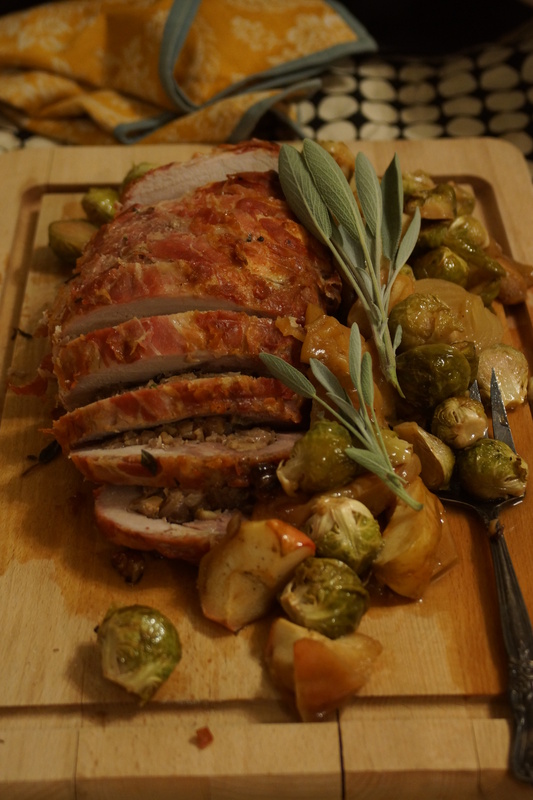 This pork roast is so good. It tastes so familiar, so comforting, so homey. It tastes like autumn Sundays of my childhood. So, now what? Am I about to share my mother’s top-secret, time-honored recipe for pancetta wrapped pork loin roulade with caramelized fennel and onions? No, I’m not. No, the only “roulade-ing” I remember my mother doing those days involved corned beef and cream cheese (which is still delicious, but not the point). 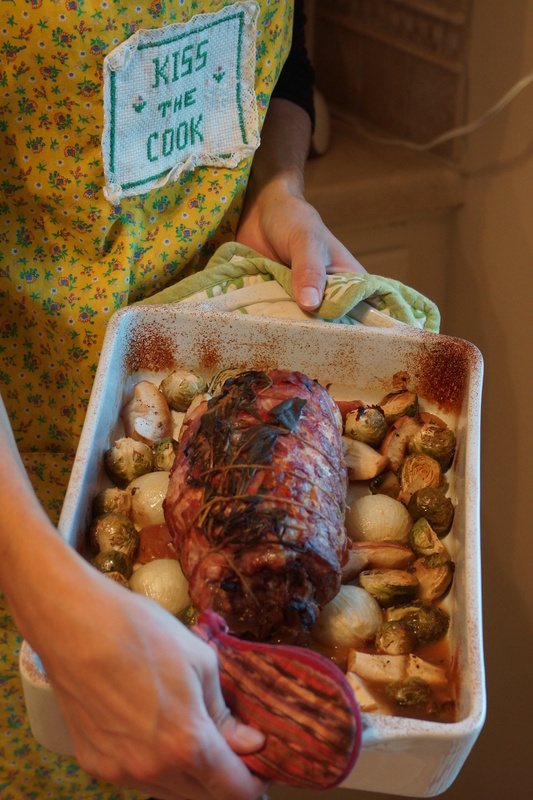 In fact, I doubt anything pancetta-wrapped or caramelized fennel-stuffed came out of her kitchen pre-2002. It finally dawned on me. It’s not the finished product- it’s the process of making it that seems so familiar. It’s spending a Sunday afternoon at home, the smell of onions cooking, padding through the kitchen to give something an occasional stir, wearing your grandma’s old “kiss the cook” apron, the sound of a football game on in the background. That’s what I remember from my childhood; that’s what I find so comforting and satisfying. But you didn’t come here for sap. You came because you’re hungry! Let’s cook. Flavor Agents, report for duty. 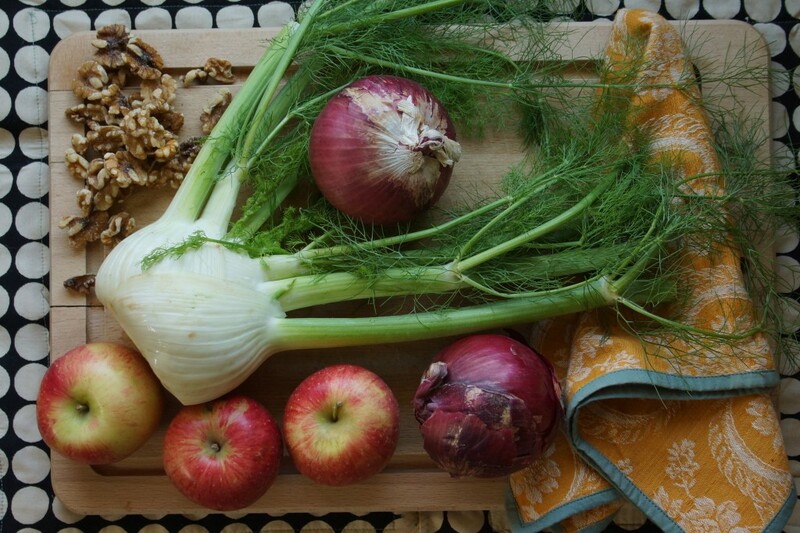 Red onions, fennel, apples, walnuts. 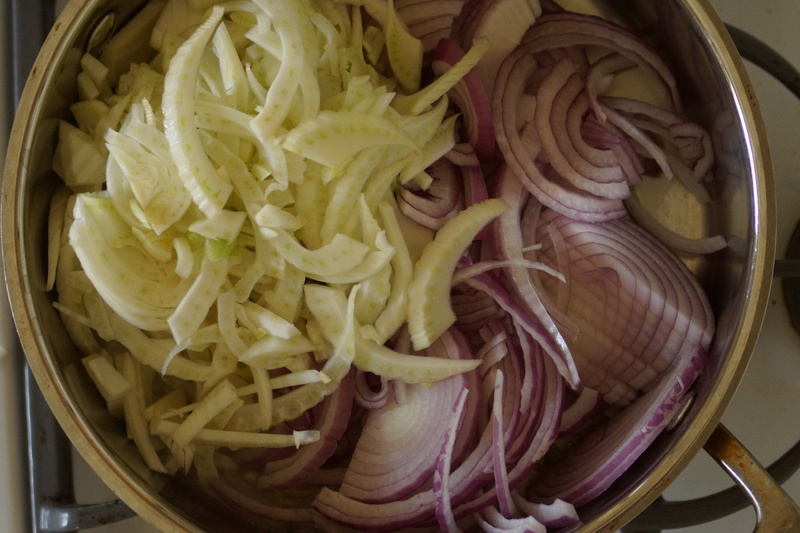 Let’s take our fennel and onions from crisp and sharp to dark, concentrated, and sweet. 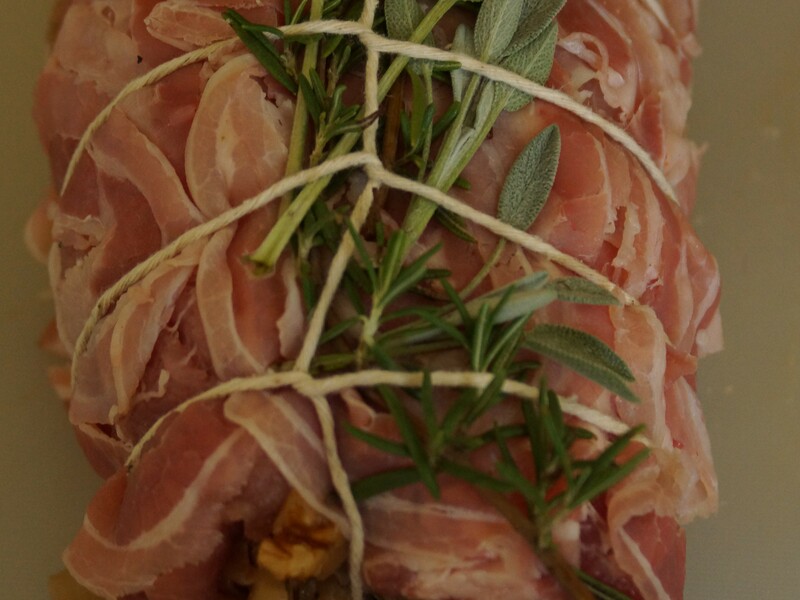 Unroll your pork and pound. Work out those frustrations. You’d never have this much fun just popping something in the microwave. Let’s put it all together now. 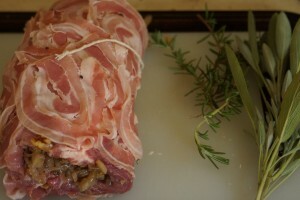 Spread on the onions, roll up the pork, wrap with pancetta. 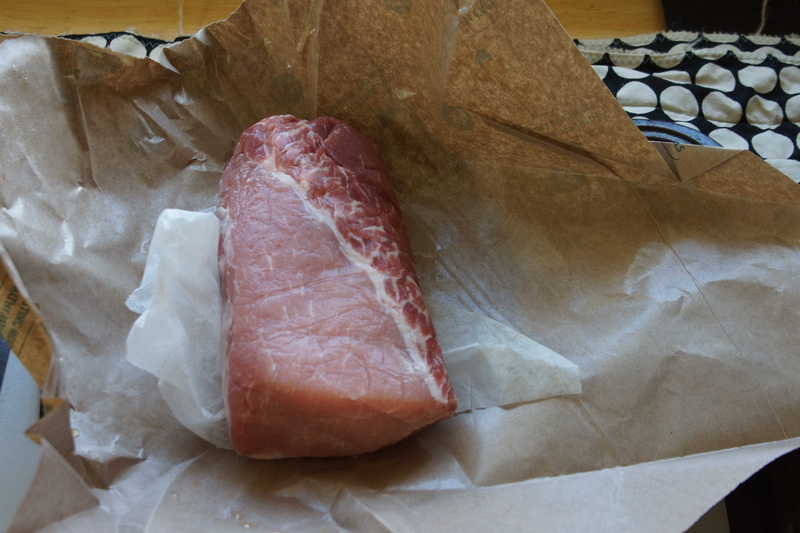 It’s like a pork on pork jelly roll…I wish I looked this good in pink. 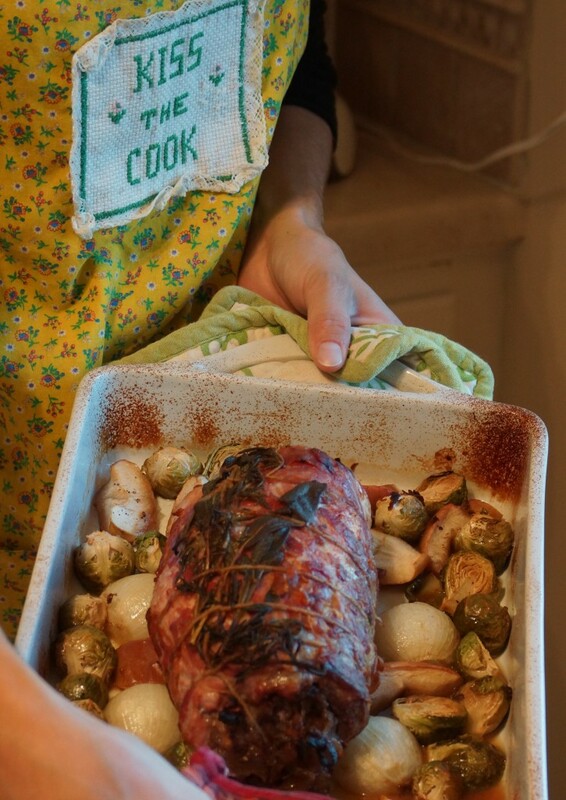 Brown on the stove and place over apples, onions, and Brussels sprouts. Add cider and you’re oven-ready. 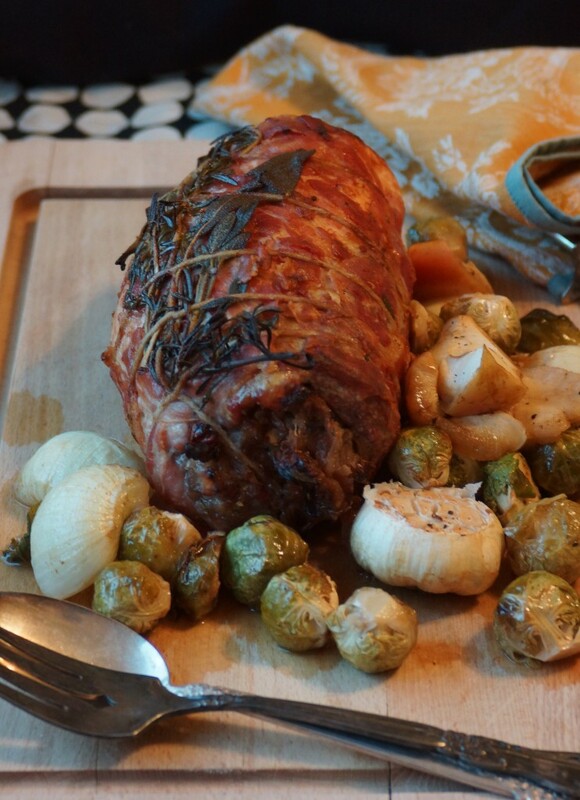 Roast, let rest. Mash potatoes, open some wine, and call your mom if she’s not across the table from you. 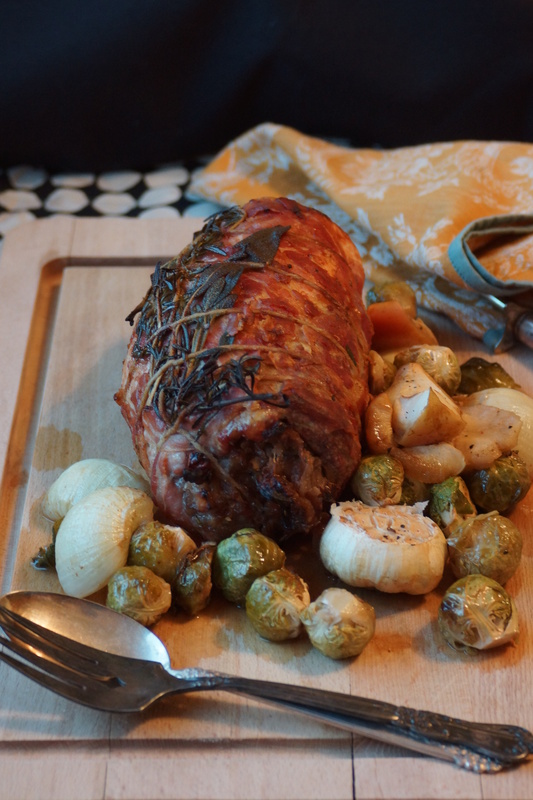 This pork roast could easily be assembled the day before you plan to serve it. 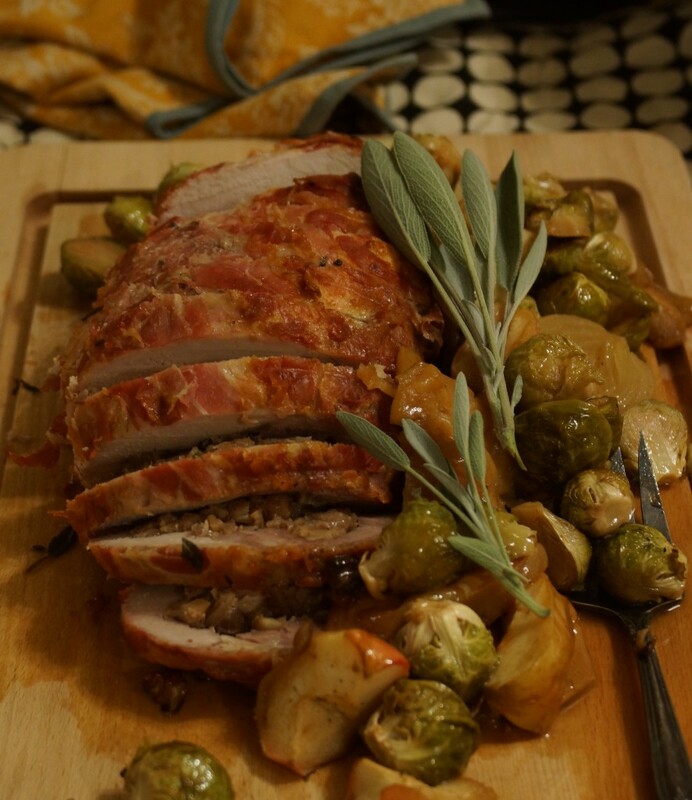 I served it with brussel sprouts, roasted in the same pan and mashed potatoes. 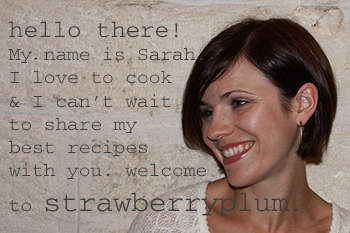 It would be delicious served with polenta or squash puree as well. Heat 1 Tbsp. butter and 1 Tbsp. olive oil together over medium-low heat. 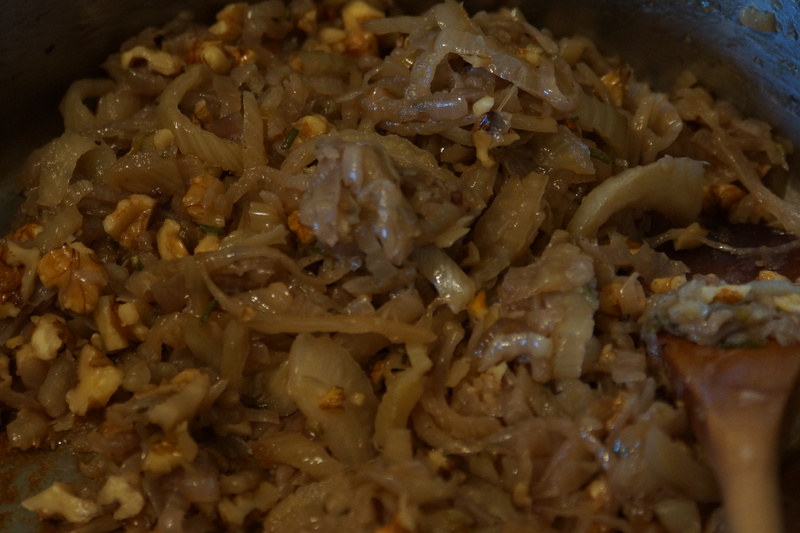 Add sliced onions and fennel, season with salt and pepper, and caramelize slowly over low heat, about 2 hours, stirring occassionally. Add 1 tsp. 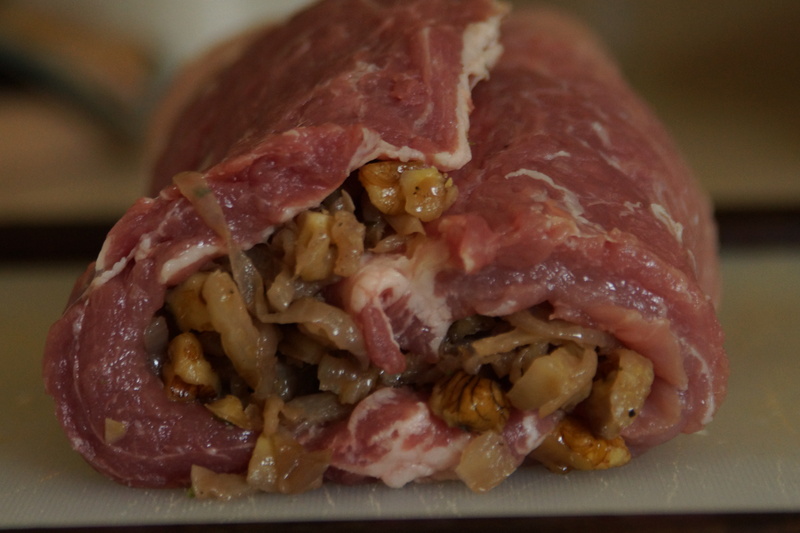 chopped rosemary and walnuts towards the end and season as neccesary. 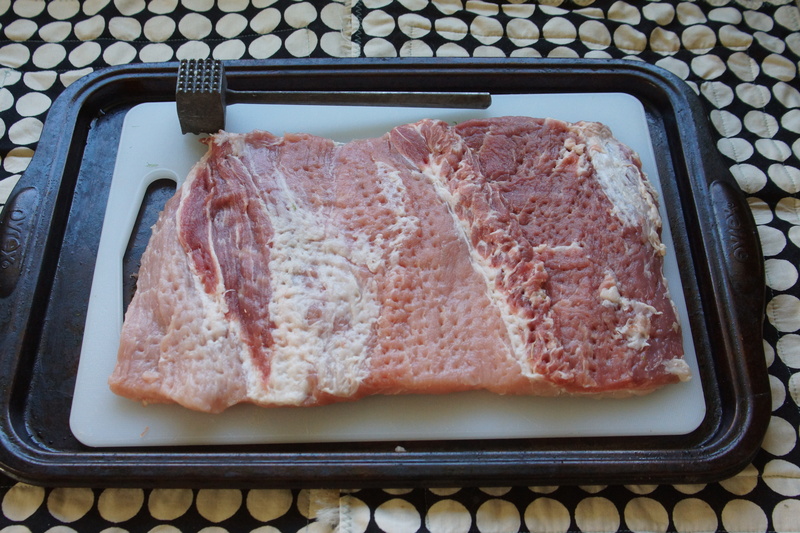 Roll cut pork loin to create a rectangle. Pound to even thickness and sprinkle with salt and pepper. 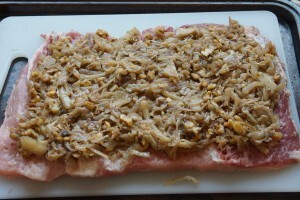 Spread flattened pork with onion-fennel mixture and roll. Cover rolled pork loin with slightly overlapping slices of pancetta and secure with cooking twine. 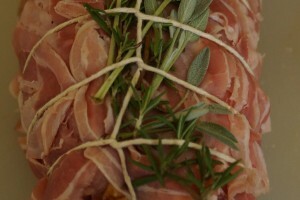 Tuck sprigs of sage and rosemary under twine. 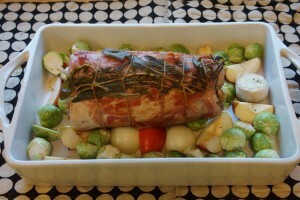 Place apple wedges and halved white onions (and brussel sprouts, if desired) in roasting pan. Heat 1 Tbsp. 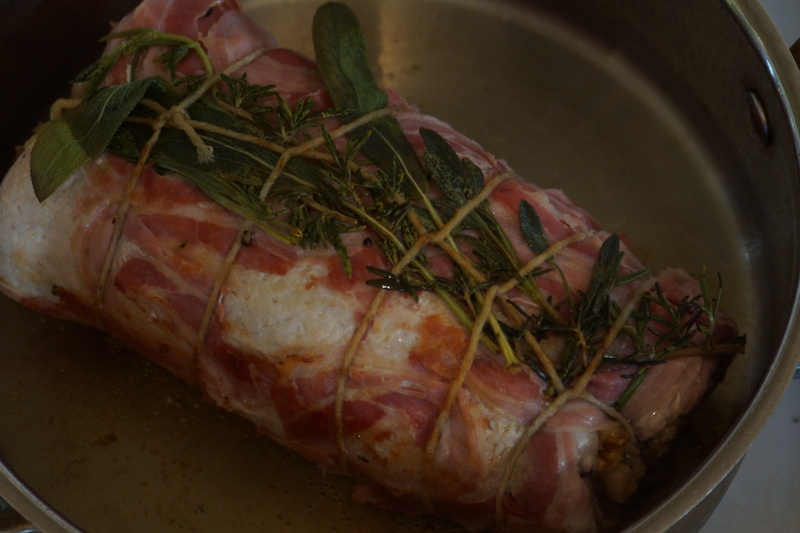 olive oil in large skillet over medium-high heat and brown pork evenly on all sides, about 10 minutes. 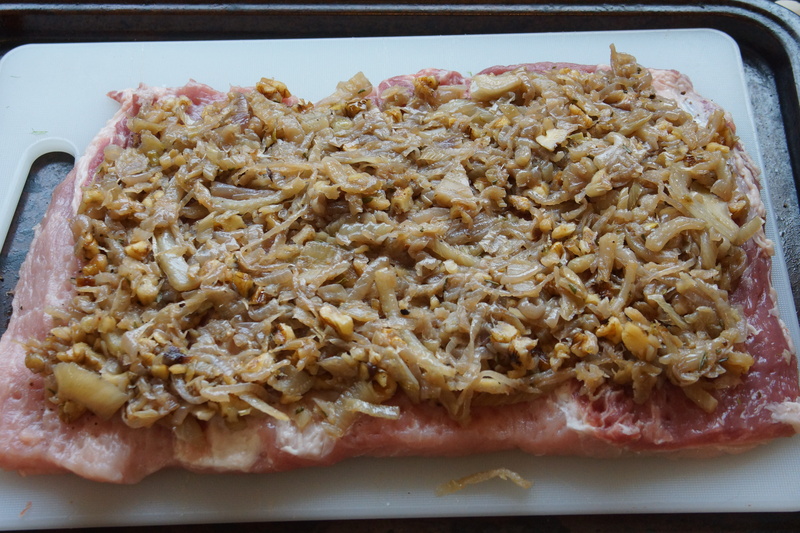 Place browned pork over apples and onions. Pour apple cider into skillet and bring to boil, scraping up brown bits. Pour in roasting pan. Roast pork about 1 hour, until internal temperature reaches 140°. Remove roast, apples, onions, and brussel sprouts from pan and tent under foil for half hour before slicing and serving. 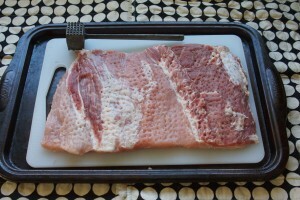 While pork is resting, strain pan juices, skim fat from top, and reduce in small sauce pan. Remove from heat and finish with 1 Tbsp. butter. Does this mean you’re making Thanksgiving dinner???? Your sister will love this! Great idea to freeze the veggie paste and have it on hand! Right? My winter is looking much brighter after this revelation!